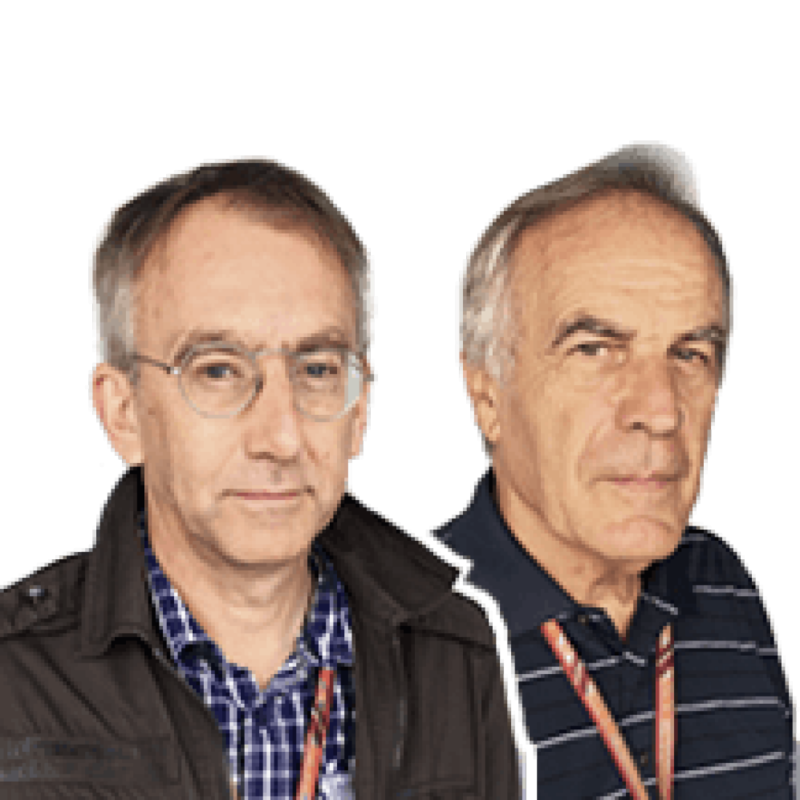 TECH TUESDAY: Were Ferrari held back by their own upgrades in Suzuka? 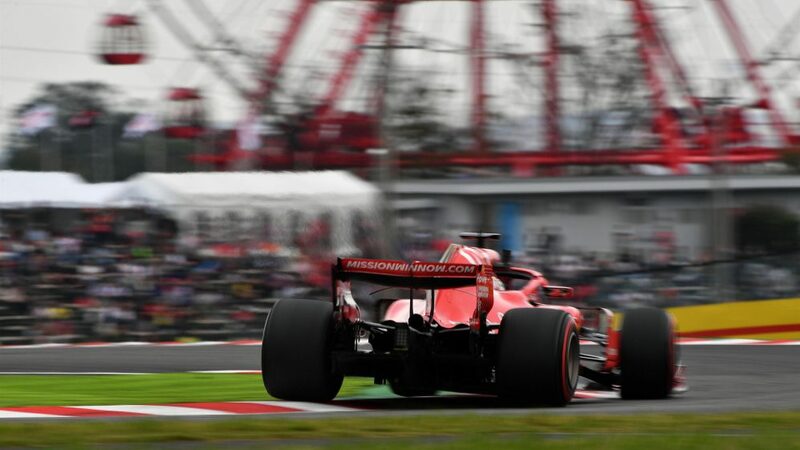 Although the story of Ferrari’s qualifying at the Japanese Grand Prix was dominated by the ill-fated choice to begin Q3 on intermediate tyres rather than the slicks of everyone else, this unfortunately had the effect of muddying the waters of how competitive Ferrari actually were going into Saturday. Both drivers reported the car much improved compared to the previous day, following the overnight removal of two recent ‘upgrades’. These were the new rear wing introduced at Singapore and a new rear suspension that had been configured to take fuller advantage of the rake made possible by the new front wing and associated parts introduced in Sochi. 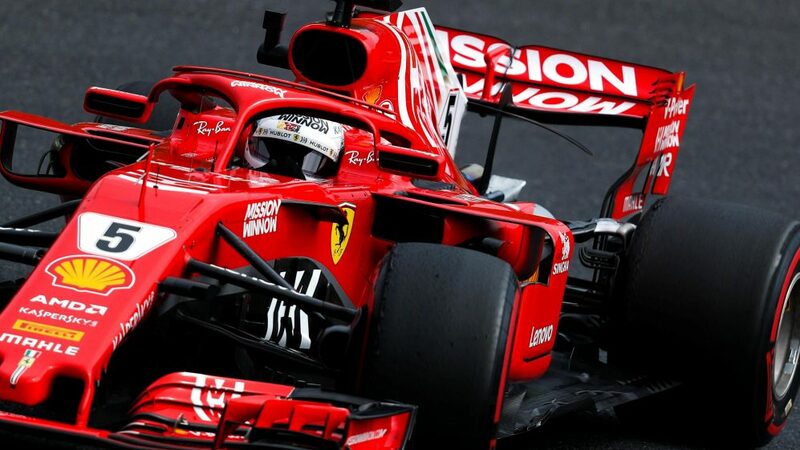 With neither Sebastian Vettel nor Kimi Raikkonen entirely happy with the car during Friday practice, Ferrari’s development driver Daniil Kvyat back-to-backed the old spec and the new in the Maranello simulator and reportedly confirmed that the old set-up was better. 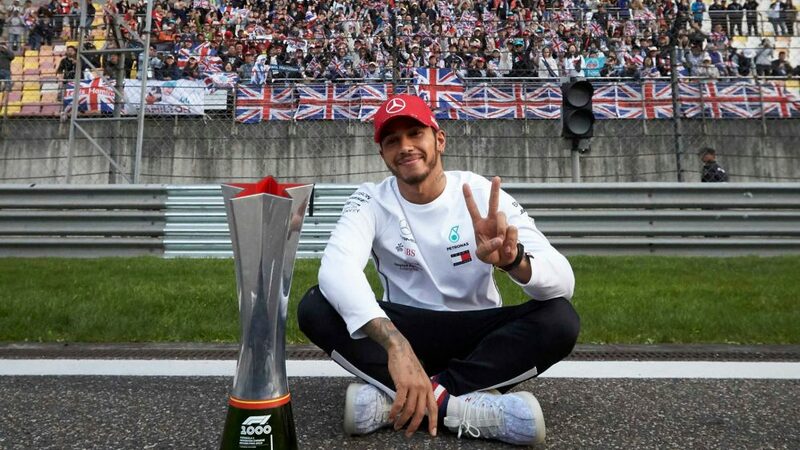 Both new parts were removed on Friday night in Japan and replaced by older, standard components, suggesting that the team’s recent development programme had rather gone awry. The rear wing introduced in Singapore had big McLaren-like lateral slots in the endplates below the level of the flap’s underside, which were angled in a way that implied they would reduce the difference in air pressure between the top and underside of the flap at the outer edges and therefore reduce peak downforce. Why would they be looking to reduce downforce? 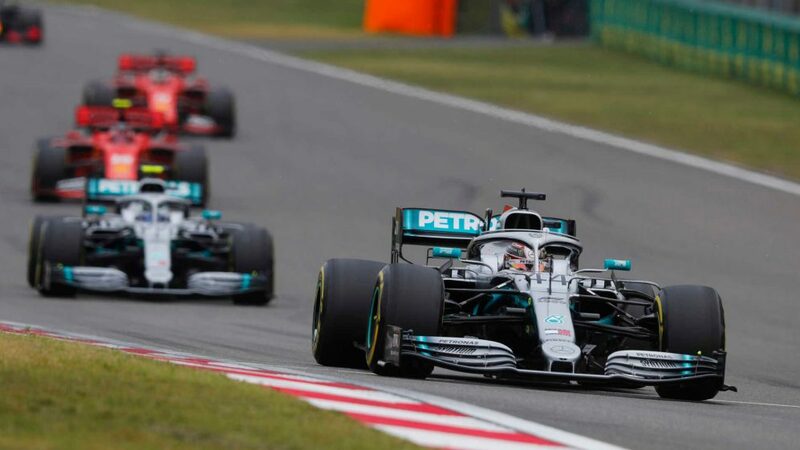 The idea would be to make a smoother, more progressive, transition to maximum downforce as the car is turned into the corner, even if the peak was slightly lower. 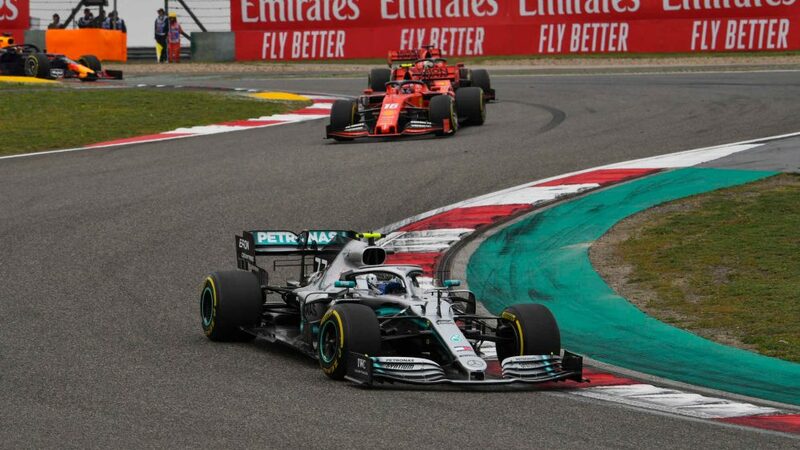 It is a concept of endplate that McLaren have used all season and which Mercedes adopted from quite early in the year and have continued to develop further. However, it was the first time Ferrari had used it and it remained on the car through the Sochi weekend and into Friday at Suzuka. 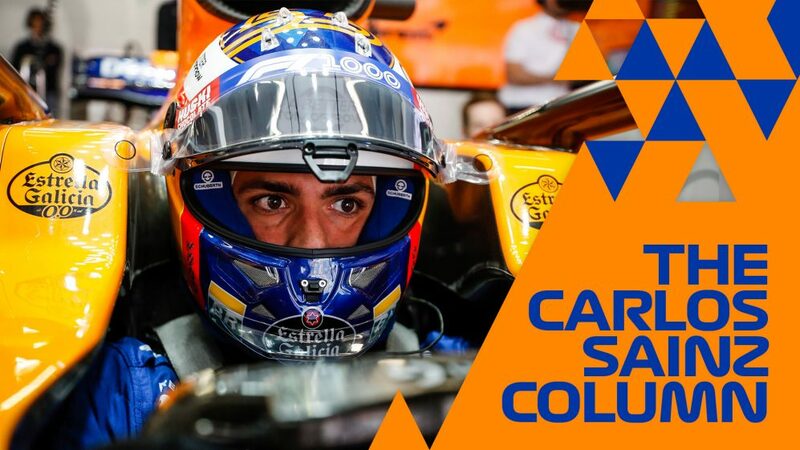 The feedback of all three drivers suggests it wasn’t behaving as intended, and the rear wing actually used in qualifying and race was the Silverstone-style one with standard endplates. However, Ferrari’s extensive front wing and under-nose guide vane updates introduced in Sochi remained on the car. This wing (pictured above) featured a less aggressive profile of the main plane (1), but a more intricate and aggressive footstep area on the outside of the endplate as well as an extra outwash fin. 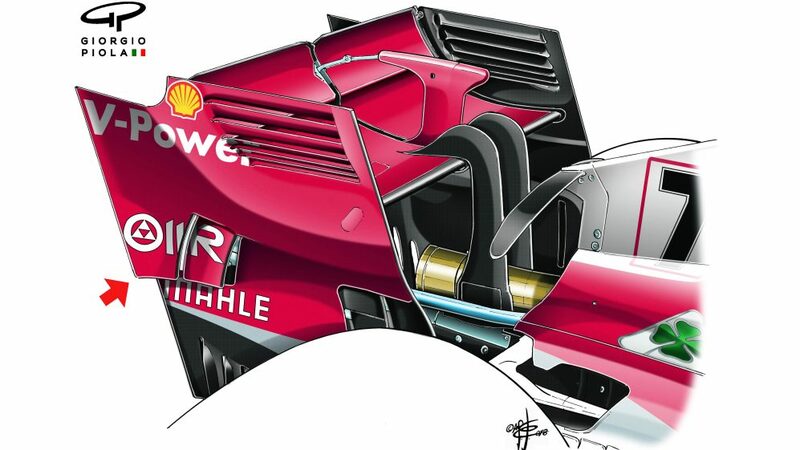 The way the lower edge of the wing arches upwards at the outer ends to form a more pronounced vortex-inducing arch (3) implies that the vortex of spinning air between the front wheels and sidepods that is created by these arches will be bigger and more powerful. These spinning vortices draw the airflow over the wing, past the tyre and down the side of the body faster, increasing downforce. The pressure they create around them also helps separate out the airflow down the outside of the body with that heading for the radiators and floor. The new slotted guide vane (2), similar to that seen on the Red Bull and the Mercedes, will feed more airflow into the underfloor. 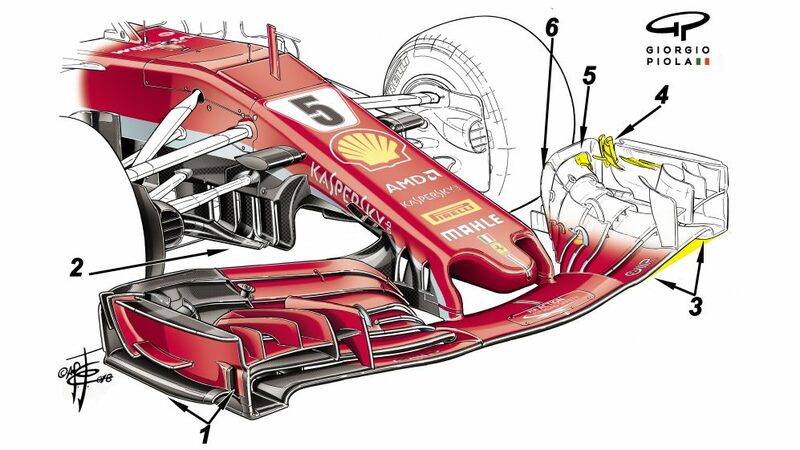 This combination of changes would in theory facilitate a greater degree of rake to be run, this further increasing the underbody downforce created. When rake is increased, the front wing itself is presented to the air in a more aggressive way – and it may be for this reason that the main, central part of the wing (which is the part that creates front downforce directly) is profiled less aggressively than before, so as to make it less stall-prone. The more the car is raked, the greater contrast there tends to be between the central and endplate parts of the wing, as the endplate is largely being used to accelerate the air as fast as possible around the tyre, hence the extra outwash fin and the reprofiling of the endplate flaps (5 and 6). 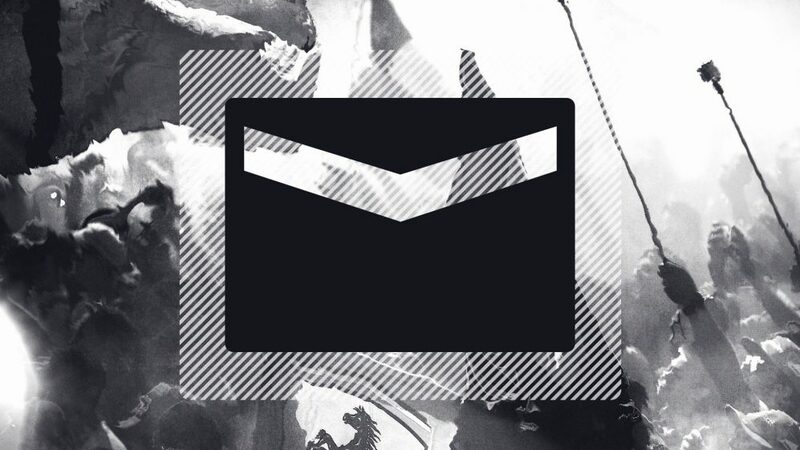 So the endplate design becomes more aggressive with more rake, the main profile less so. Details of the new rear suspension that was introduced with this front wing are sketchy, but it’s likely that the increased rake the new aerodynamics made feasible required slightly different pick-up points to facilitate the required increased rear ride height. 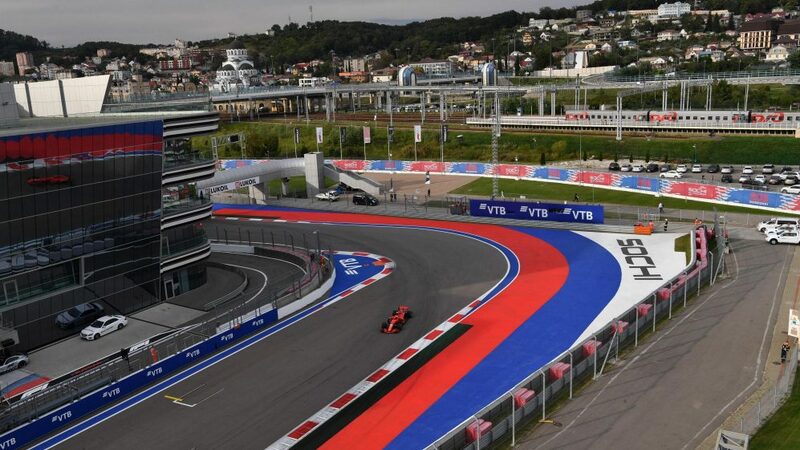 It was notable that in Sochi, Ferrari were losing most of their time to Mercedes in sector three, where they were having difficulty keeping their rear tyre temperatures under control. 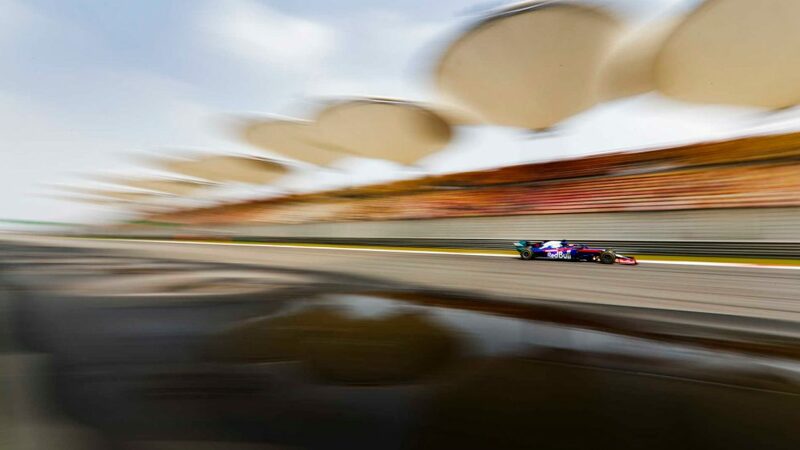 Over 60% of the lap time deficit was coming between Turns 16 and 18 – i.e. at the end of the lap as the tyres became too hot. The last time Ferrari suffered similarly was at Barcelona, and on that occasion it was found that rear suspension changes to improve airflow had a negative impact upon how the rear tyres were treated. 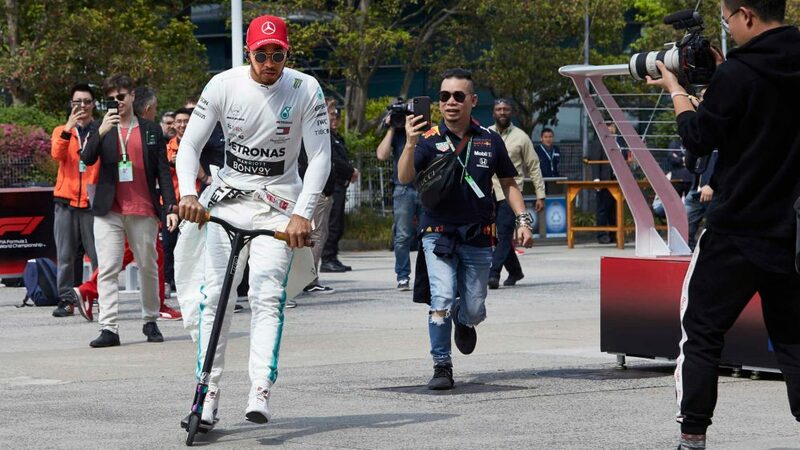 The suspicion is that the recently introduced rear suspension was responsible for the tyre problems in Sochi and on Friday in Suzuka. Both Vettel and Raikkonen reported the car much improved into Saturday, but the tyre choice error rather disguised that improvement. 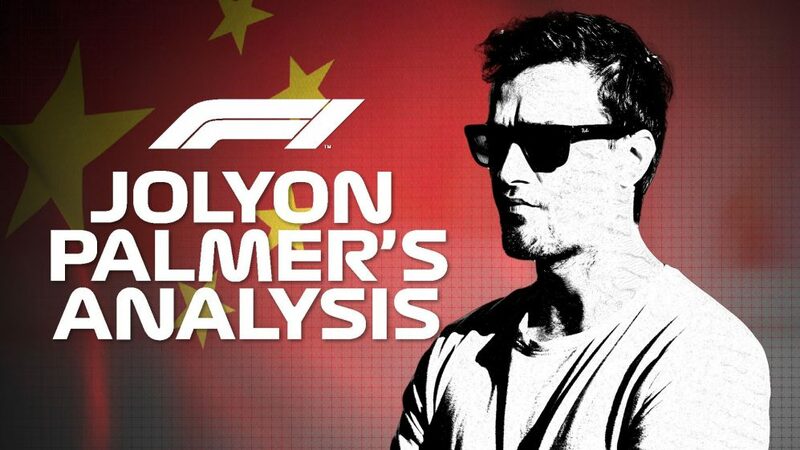 It all illustrated how intricately connected the mechanical and aerodynamic programmes have to be, and how easy it is – even for a team of Ferrari’s resource – to get blind-sided.